Solid tires are the go-to industrial tires for rugged applications including demolition, mining, construction, and recycling. These tires offer maximum puncture resistance and are 100% flat-proof – due to their layers of durable, tough rubber – which translates to minimal machine downtime especially when compared with pneumatic tires. They are particularly reliable in skid steer operations as their exceptional durability and resilience ensure that the tires do not wear out fast due to the “skidding” action of the machine wheels as it makes turns. 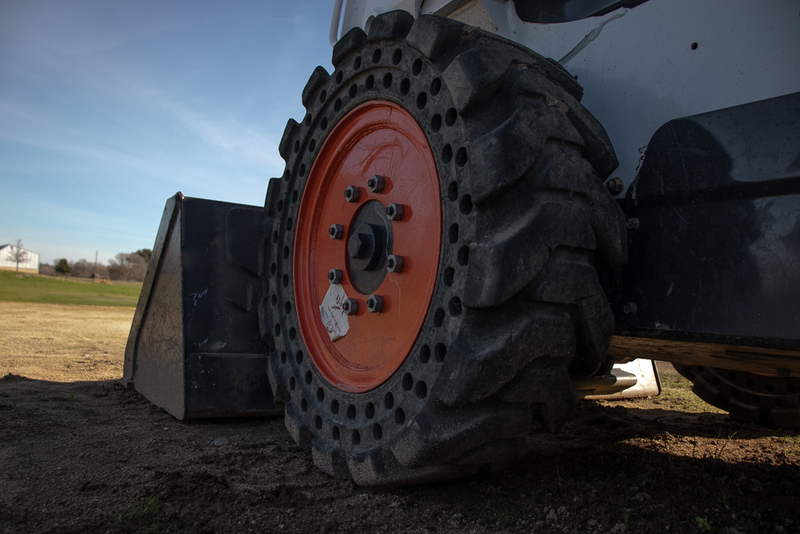 Skid steer solid tires usually feature apertures in their sidewalls. These holes provide a smooth cushioned ride as the skid steer is operated, enhancing operator comfort and, in turn, maximizing productivity. When it comes to sidewall aperture designs, there are many options to choose from. Each has their specific pros and cons. In this article, we take a look at some common solid tire aperture designs. The simple round hole or aperture solid tire is the most common sidewall aperture design for solid tires in the market. Compared with other solid aperture tires, these are the cheapest to manufacture as they require less rubber. This means they are also sold cheaply. The problem with these tires is that they do not provide sufficient cushioning due to the amount of rubber used. Another disadvantage of using round hole solid tires is stress cracking caused by operating your skid steer with heavy loads over time. The round holes compress under heavy loads, creating a pinch point which leads to cracking. Staggered holes on the sidewalls of solid tires deliver a much more cushioned ride than the simple round aperture design. But they also suffer from stress cracking, just like the round hole design, as pinch point are also created when the tires support heavy loads over a period of time. Featuring oval holes, as opposed to round, the elongated aperture design provides slightly better cushioning than the round aperture design. This is because more rubber is used in their manufacturing. Unlike the round hole design, stress-point cracking is greatly minimized due to the oval shape of the holes which causes them to compress to circles as opposed to pinch points. These tires are able to handle heavy load operations without premature damage from stress cracking. There are many innovative aperture designs for solid tires besides round, staggered and elongated. Some solid tires are specially designed to provide the same level of operator comfort as pneumatic skid steer tires. These tires feature different shaped-holes, strategically placed along the sidewalls to provide maximum shock absorption and reduce bouncing. These tires are also less prone to stress-point cracking as pinch-point creation under heavy loads is significantly reduced. The only real con with these tires is that they are more expensive to manufacture and, as a result, they are higher priced than other solid aperture tires. Here at Monster Tires, we pride ourselves on customer satisfaction, fulfilling your orders in the most timely manner possible, and providing the most cost-efficient rates within our scope of possibilities. Our aim isn’t just to sell you a few sets of solid skid steer tires, but to build a relationship you can depend on to last a lifetime. Contact our professional and courteous customer service representatives today and you will see why many are calling Monster Tires the one-stop shop of solid skid steer tires. This entry was posted in Skid Steer, Solid Tires. Bookmark the permalink.